Reliable and waterproof sun protection for sensitive skin. Also suitable for the sun-sensitive, delicate skin of babies and children. Aqua, Helianthus Annuus Hybrid Oil*, Titanium Dioxide, Polyglyceryl-3 Polyricinoleate, Dodecane, Alcohol*, Caprylic/Capric Triglyceride, Glycerin, Helianthus Annuus Seed Oil, Butyrospermum Parkii Butter*, Sodium Lactate, Hydrogenated Castor Oil, Mangifera Indica Fruit Extract*, Simmondsia Chinensis Seed Oil*, Daucus Carota Sativa Root Extract*, Capsicum Annuum Fruit Extract, Behenyl Beeswax, Stearyl Beeswax, Stearic Acid, Alumina, Xanthan Gum, Beta-Carotene, Tocopheryl Acetate, Tocopherol, Ascorbyl Palmitate, Parfum**, Limonene**, Linalool**, Geraniol**, Citronellol**, Citral**, Coumarin**, Eugenol**, Benzyl Benzoate**, Benzyl Alcohol**. Apply sun cream before exposure to sun, re-apply after swimming and towel drying. 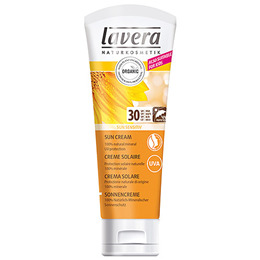 Below are reviews of lavera Sun Sensitiv Sun Cream SPF30 - 75ml by bodykind customers. If you have tried this product we'd love to hear what you think so please leave a review. New to Lavera products but fast becoming a fan. Used this for the first time whilst out fell walking in very hot weather in the Lake District & it gave good protection. It's quick to apply & a little goes a long way plus there's none of the nasties that other products have. Recommended. 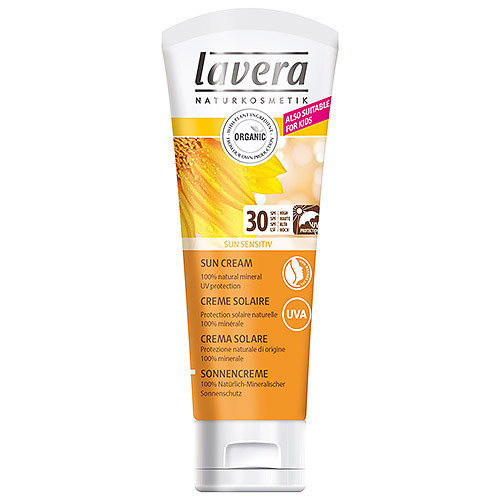 Usually I find Lavera products excellent. The reason I'm giving only 3 stars is that although this sun screen is probably really good, I personally cannot get on with it as it's too white on my pale skin. However, Bodykind deserve at least 5 stars for responding to my request for an exchange - they have been both courteous and efficient.